One thing Ichi is missing out due to his blindness. 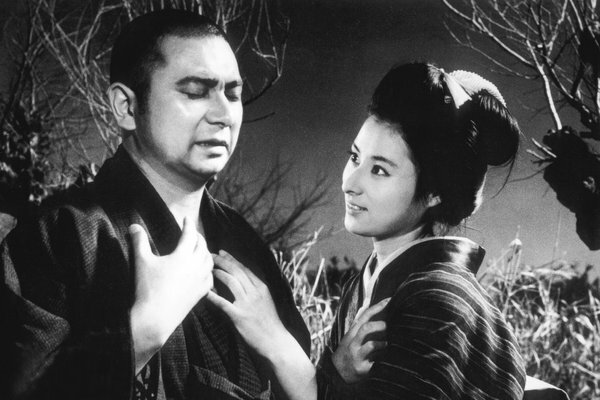 Now that I’m finally done with grad school, I think I’m allowed some good old-fashioned swordplay movies, and I kicked off my summer with the Japanese classic The Tale of Zatoichi (座頭市物語, zatouichi monogari). The Tale of Zatoichi follows the titular blind swordsman (Katsu Shintaro) as the yakuza attempt to recruit him to fight their war against a rival gang. Along the way, Ichi meets another swordsman Hirate (Amachi Shigeru) and Tane (Banri Masayo), a woman caught up in a problematic marriage. Initially, what The Tale of Zatoichi reminded me of was Three Outlaw Samurai, which I saw last fall. As Three Outlaw Samurai came out two years later, I think it’s reasonable to assume it drew upon The Tale of Zatoichi for inspiration. While Zatoichi is now known as a character who is extremely skilled with a sword despite his blindness, this first movie really underplayed that. Ichi only drew his sword twice over the course of the movie; the rest of the time, he opted to simply use his presence to make his point. Ultimately, Zatoichi was a story about honor, even among gangsters, demonstrating a collective Japanese yearning for the good old days. It was subtle, it was fun, but overall it wasn’t anything spectacularly deep. One thing that did sell me, however, was the absolutely gorgeous cinematography in The Tale of Zatoichi.